Israeli ambassador to Hungary demands inquiry into far-right rally in which effigies of Israeli PM, former president 'publicly hanged'. Israel's ambassador to Hungary demanded a government inquiry on Tuesday into a public hanging of effigies of Israeli leaders staged by a town mayor linked to the far-right Jobbik party. Mihaly Zoltan Orosz, mayor of Erpatak, was filmed ordering the hanging of effigies of Israeli Prime Minister Binyamin Netanyahu and former president Shimon Peres in protest against the Gaza conflict on Sunday. "Israel's leadership is in the service of the Antichrist," Orosz can be heard telling onlookers in a video available online. "The government of Hungary must act now in order to stop these very dangerous acts," Ilan Mor, Israel's envoy to Budapest, said in a statement. "I am sure that an investigation into this issue will start as soon as possible," he added. Hungary's foreign ministry condemned the incident in a statement on Monday, accusing the mayor of using the Gaza conflict "to incite hatred". Although not a Jobbik member, Orosz, mayor of the town of Erpatak since 2005, is closely associated to Hungary's third largest party, which often espoused openly racist and anti-Semitic views. 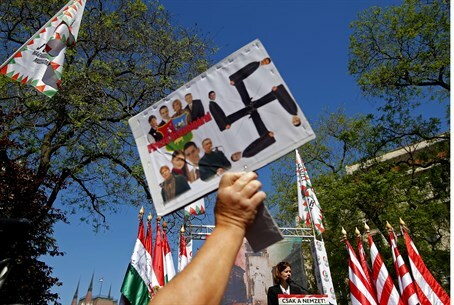 The rally appears to be Jobbik's attempt to mimic the success of far-left and Islamist groups in western Europe, who have used Israel's military operation in Gaza to stoke the flames of anti-Semitism.